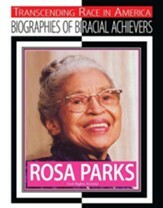 Rosa Parks forever changed the landscape of American race relations with one simple act of courage. 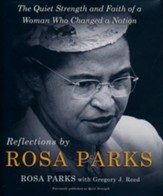 Including historic and beautiful pictures, Reflections by Rosa Parks is a collection of Mrs. Parks's own words on topics like dealing with fear, facing injustice, developing character and determination, faith in God, and her hope for the future. Her words of wisdom, humility, and compassion will inspire you to carry on her great legacy. 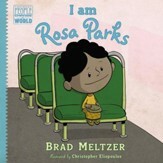 Full of adventure that will keep young children reading, Who was Rosa Parks tells the story of the woman who stood up to unjust laws and helped to spark the Civil Rights Movement. With quotes woven seamlessly into the narrative and lots of pen-and-ink illustrations, this is a remarkably detailed look at a fascinating American woman. 105 pages, softcover. Grade 3. 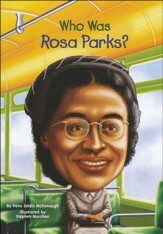 Learn about Rosa Parks ! 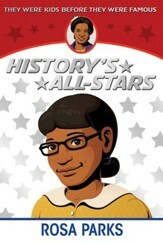 This "True Book" features plenty of photos and helpful visuals; the lively, age-appropriate text teaches young readers about this brave woman who became an icon of the American civil rights movement. Includes TRUE facts that will shock and amaze you! If A Bus Could Talk, it would tell the story of a young African-American girl named Rosa who had to walk miles to her one-room schoolhouse in Alabama while white children rode to their school in a bus. It would tell how the adult Rosa rode to and from work on a segregated city bus and couldn't sit in the same row as a white person. 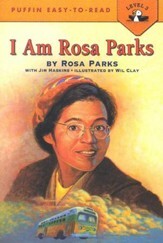 Let your beginning readers read of Rosa Parks for themselves. For ages 6-9, this book is perfect for the child who reads alone, including colorful illustrations and easy to understand text. 48 pages, softcover. It seems like any other winter day in Montgomery, Alabama. Mama and child are riding where they're supposed to - way in the back of the bus. The boy passes time watching his marble roll up and down the aisle, until from way up front a big commotion breaks out. 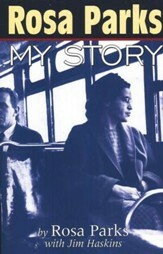 Tired of giving in, Rosa Parks' courageous act sparked a widespread interest in the Civil Rights Movement. 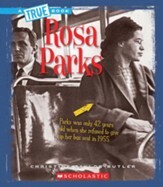 This engaging biography features the story of her life, including the political context, and what empowered her to stay seated when told to move. On December 1, 1955, Rosa Parks refused to give up her seat to a white man on a segregated bus, sparking the Montgomery, Alabama, bus boycott. A year later, when the boycott finally ended, segregation on buses was ruled unconstitutional, the civil rights movement was a national cause, and Rosa Parks was out of a job. 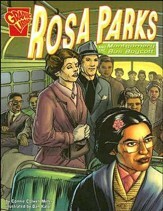 Yet there is much more to Rosa Park's story than just one act of defiance. 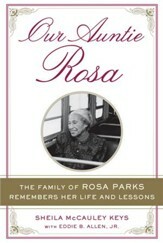 In straightforward, moving language, she tells of her vital role in the struggle for equality for all Americans. Her dedication is inspiring; her story is unforgettable.